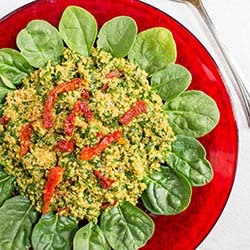 Spinach Parmesan Quinoa is gluten-free with only 5 ingredients. Takes just minutes to prepare. 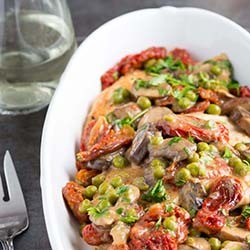 Great for busy weeknights. 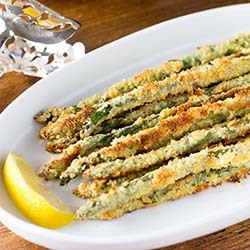 Panko Parmesan Crusted Asparagus – Asparagus is encased in a crispy coating of panko-parmesan crumbs resulting is a vegetable that tastes more like a treat. 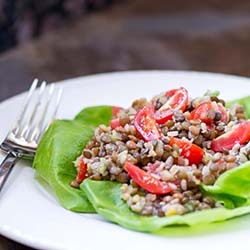 Lentil Salad with Sherry Vinaigrette is vegan, gluten-free and has 13g of protein and 15g of fiber per serving. 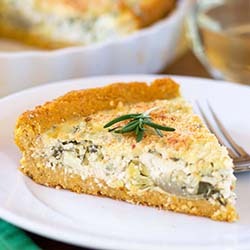 Artichoke Rosemary Polenta Tart-gluten-free and vegetarian with a filling made of Greek yogurt infused with fresh herbs. No rolling pin required. 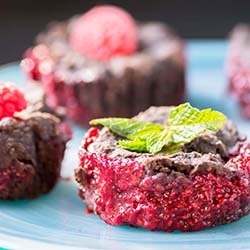 Raspberry Chia Black Bean Brownie Cups – A layer of sweet, tart raspberry chia jam nestled inside of a dark chocolate, fudge-like brownie. 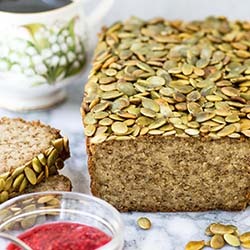 Gluten-free, low in sugar, high in fiber. The healthiest, most decadent brownie ever. 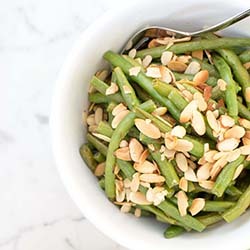 Maple Mustard Roasted Green Beans with Toasted Almonds – a quick and easy side dish that’s impressive in taste and appearance. 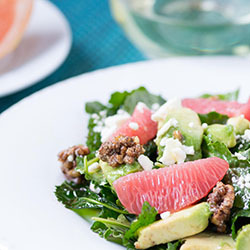 Baby Kale and Grapefruit Salad with Campari Vinaigrette – a simple and sophisticated salad with a vinaigrette made from the classic Italian aperitif Campari. Best Lemon Chicken Ever! 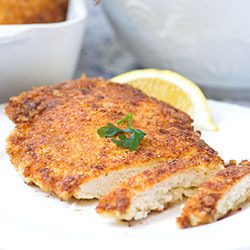 Panko Parmesan Crusted Lemon Chicken is crispy, lemony, juicy and delicious. 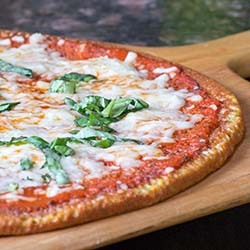 Thin and Crispy Quinoa Crust Pizza. 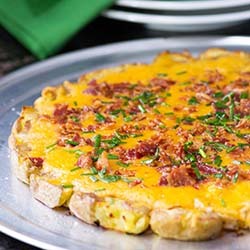 Thin crust fans will love this pizza! No blender, mixer, or soaking required. Gluten-free. 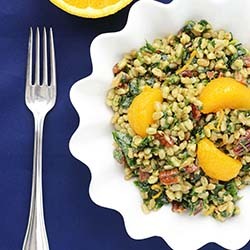 Orange Pecan Farro Salad – a delicious salad that highlights the super grain farro. 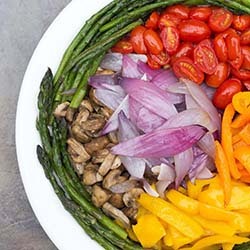 Farro is higher in protein and fiber than most other whole grains. 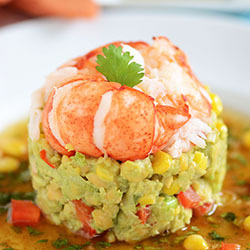 Lobster, Avocado, and Chickpea Salad with Lime Cilantro Vinaigrette is packed with bright, fresh, bright, nutritious flavors. 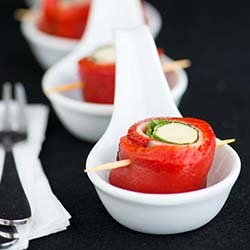 Serve as a light meal or an elegant first course. Gluten free too. 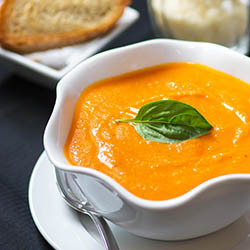 Roasted Garlic Cream of Tomato Soup is thickened with Yukon gold potatoes. 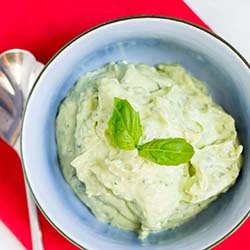 Perfect with French bread or a grilled cheese sandwich. 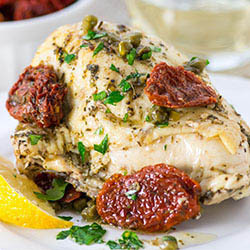 Roasted Chicken Breasts in Date Sauce with Sun Dried Tomatoes and Capers. This dish makes its own delicious sauce as it roasts and tastes like something you’d be served at a French bistro. 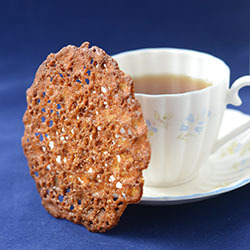 Quinoa Lace Cookies (gluten-free) – Beautiful and delicate with butterscotch and caramel notes. 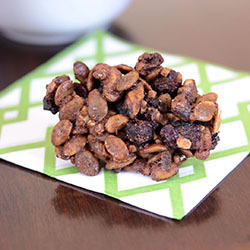 No mixer or stove top prep required. 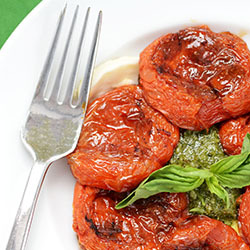 A winter version of the Italian classic Caprese Salad made with Slow Roasted Tomatoes, Fresh Mozzarella, and Basil Cashew Pesto. 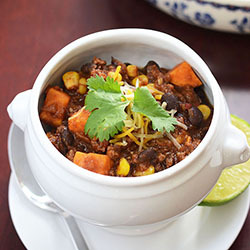 Turkey, Sweet Potato, and Black Bean Chili with Chipotle and Chorizo. Sweet, spicy, smoky and utterly delicious – the perfect game day chili. Snack Bar Madeleines – make your own fruit and nut bars using a madeleine pan. 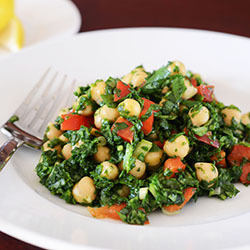 Chickpea Spinach Salad is packed with fiber and protein and can be served as a main dish, side dish or appetizer. Great for vegans! 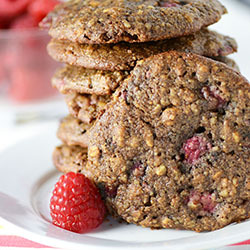 Raspberry Almond Breakfast Cookies – a perfect on-the-go healthy breakfast. Vegan and gluten free with 5g of fiber, 8g of protein, and only 7g of sugar. 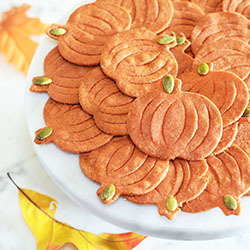 Perfect for Thanksgiving – vegan, gluten free crackers made with super healthy ingredients. 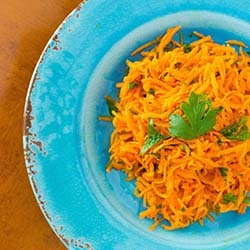 Great with humus. 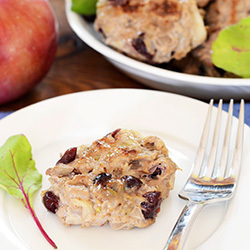 Cranberry Apple Chicken Sausage Patties highlight the flavors of autumn and can be eaten for breakfast, lunch, or dinner. Gluten free too. 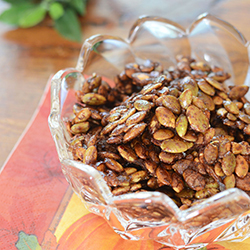 Maple Glazed Pumpkin Seed Clusters – pumpkin seeds roasted in coconut oil, coated with fall scented spices, and glazed with maple syrup. 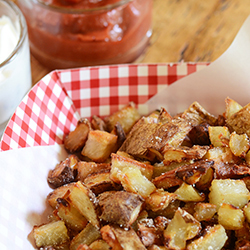 Crispy Parmesan Potato Bits are a little bit of french fry heaven without the toxins imparted by deep fat frying. 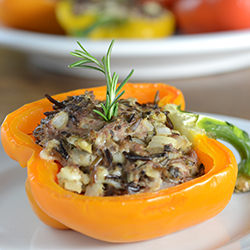 Blue Cheese, Rosemary, and Wild Rice Stuffed Peppers – a fantastic make ahead dish for casual entertaining. 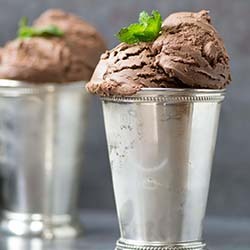 Gluten-free and only 262 calories per serving. 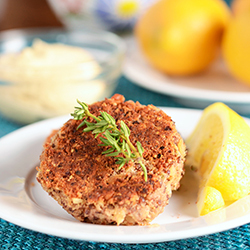 Quinoa Cannellini Cakes with thyme and fennel are gluten free and protein packed. 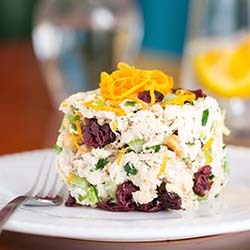 Serve as an appetizer, main course, or on top of a salad.